Lace, Pearls and Neutrals. This outfit has so many of my favorite things. I am sooo happy that it is friday. And I am so excited because I am finally getting my hair colored tomorrow. Which is much over due. I usually color and highlight the top and sides of my hair myself. But I can not see the back. So I currently have about 4 inches of dark roots in the back that are driving my crazy. Getting my hair done just makes everything look and feel better. Don't forget about the Tory Burch friends and family sale that is going on through Monday. Use code Friendly to get 25% off! Here are a couple more of my picks! I mean I pretty much love everything on the Tory Burch website! Happy shopping. Have a great weekend. Thank you so much for reading! You do neutrals perfectly!! I just bought the two Ann Taylor tops you recently featured and love them! Just need some warmer weather here in WI so I can wear them! Can't get any more feminine and ladylike than this outfit. Stunning from top to bottom. Love that lace skirt! Looks so pretty on you! Gorgeous and glamorous outfit! White and red always go so well together! Gorgeous, feminine look! I love lace and pearls together. The pop of red is amazing! Great look! Looking fabulous! Love the loubs that pair perfectly with the red bag! Such a classic and fabulous look! 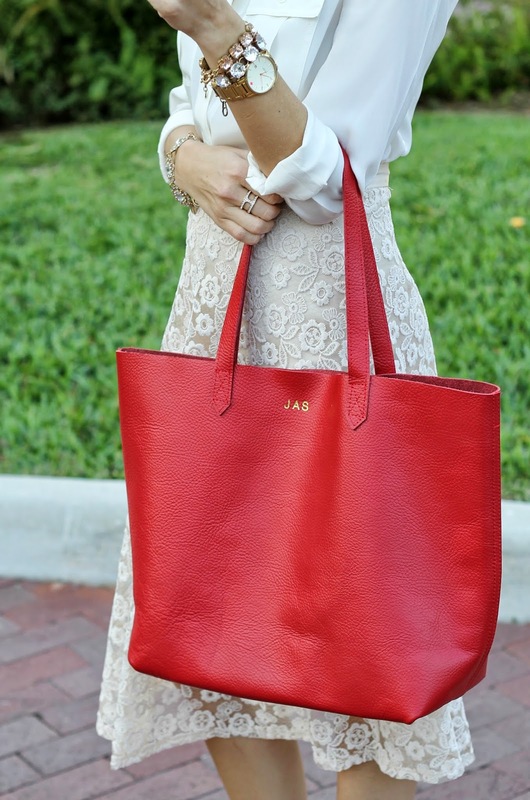 I love that lace skirt and the pop of red with the bag was the perfect touch! I am obsessed with that skirt as well!! I feel like a broken record, but, I love this!! I just posted a similar skirt over on Posh Pair earlier this week. Seriously can't go wrong with a lace skirt. Have a great weekend! love this stunning and classy look! Fabulous, timeless look! One can simply never go wrong with lace and Louboutins! Classic, classic, classic pairing! So Chic! oh Jade I blame you and this skirt to further feeds my obsession of skirt this season! I can't stop looking for more and more to be added onto my wishlist!!! So chic! Love this look! I love how you have a pop of red, edges up the outfit and provides a good balance with the delicateness of the lace! And you're hair looks so fabulous! It's perfectly put up! Eh hello sophisticated lady...this outfit it gorgeous! Wow, really nice, love the combination of colors. The most perfect, lady like look I have ever seen!